Trying to get a good night’s sleep requires more than just a warm blanket and some comfortable pajamas. You need to make sure you’ve got the ideal sleep setup. That means the right mattress and, of course, the right pillow. However, we’re not reviewing your basic pillow today. The ZEEQ Pillow by Rem-Fit, which looks to revolutionize the classic bedroom fixture with smart technology, is much more than something to lay your head on. Something that stood out immediately about the pillow my first night using it was the comfort. 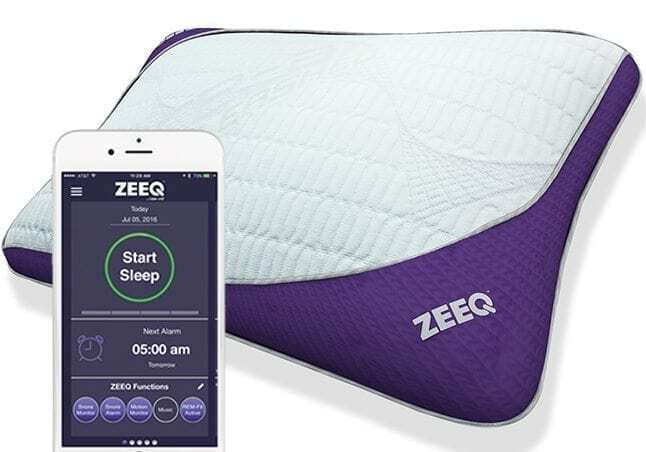 As somebody who doesn’t get a good night’s sleep without a great pillow, I can say that the ZEEQ Pillow helped me get more restful sleep than I’ve gotten in quite some time. In addition to its comfort, the ZEEQ Pillow also acts as a personal sleep assistant. By connecting with a downloadable app, I was able to track my personal sleep info. However, one of the ZEEQ Pillow’s single greatest features is the ability to allow your bedmate to sleep just as soundly as you. You see, many sleepers such as myself need to listen to something during bedtime. The problem is that it’s not ideal for everybody, as anyone in earshot will likely be bothered. And, if we’re being honest, trying to sleep comfortably in headphones is a nearly impossible task. However, the ZEEQ Pillow does a great job of addressing this issue, as it can stream music directly from a variety of apps – from Spotify to Pandora and more. So, whether you prefer some light acoustic music, a calming podcast, or even hard rock to lull yourself to sleep, the options are there. In addition, the pillow can combat snoring, something many people (possibly myself…) have struggled with throughout the years. The ZEEQ Pillow does this by actively hearing you snore through its built-in microphone and literally reminding you to move positions with some gentle vibrations. Needless to say, this will make you (and anyone in earshot) sleep more soundly. While I was initially a bit skeptical of the concept of a “smart pillow,” I can honestly say the ZEEQ Pillow is a fantastic idea. As someone who has trouble getting a good night’s sleep, loves listening to music when bedtime rolls around, and who may or may not have a bit of a snoring problem, I can recommend the ZEEQ Pillow for my fellow insomniacs and snorers. Your bedmate/roomates will thank you. Special offer for our readers: Use the code “INNOTECH” to get $50 off your purchase.